Focusing on the long term has always been at the cornerstone of Bezos’ empire state of mind. Beyond that, here are some key principles he employs. 1. Surround yourself with the best possible team. Amazon has a notoriously lengthy hiring process. Potential employees can expect to submit SAT scores and answer questions such as, “How many gas stations are there in the U.S.?” The answer isn’t supposed to be correct, rather it’s intended to promote critical thinking skills. “Every time we hire someone, he or she should raise the bar for the next hire, so that the overall talent pool is always improving,” Bezos says. Employee evaluations happen in real time, rather than at quarterly or annual intervals. Rating software allows peers to evaluate, congratulate and even critique each other publicly. Consider implementing a more human and live-time evaluation process into your workflow. Entrepreneurs, reach out to your peers and trusted friends—ask for candid feedback early and often. Amazon has famously failed more than a few times. To compete with eBay, Bezos once launched its own version of marketplace bidding. It flopped. But it also paved the way for Amazon Affiliates, allowing private sellers to use the site, shipping and even storage facilities to sell their own goods. Learning from failure is easy to preach and harder to practice. Remind yourself of The Amazon Story and its many failures when you’re struggling with a decision of, should I? Frugality is a near-direct opposition to modern big business practices. Bezos has preached and practiced it from the beginning. A now-famous picture depicts Bezos sitting behind a desk made out of a door propped up on two-by-fours. Amazon was already a publicly traded company at the time. Doors were simply cheaper than traditional desks and Bezos always had a thing for symbolism. No, you don’t necessarily need to go buy some door desks, but consider where you can cut some unnecessary spending. A short-term perk or comfort could hurt you in the long run. Only in recent years has Bezos graced the media with social appearances. For many years, he was content to work behind the scenes—a kind of “head down, work hard” mentality. His recent social emergence speaks to an evolution of sorts. 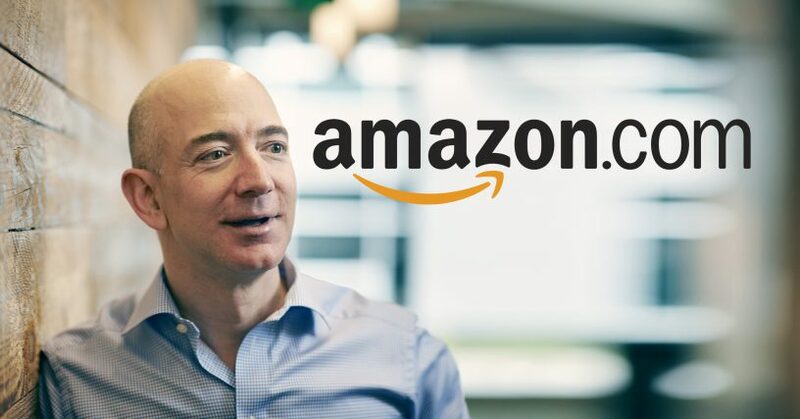 Bezos understands that in order to stay relevant and growing, you must be willing to adapt. But you must also know when to draw the line. For him, that means sticking to the big vision while allowing the smaller moving parts to fluctuate. For Bezos, compromising on customer experience was never an option. Once, he almost shut down an entire email marketing division after an embarrassing customer email was forwarded directly to him. That one email sparked a marketing overhaul. Make a list of your big-vision items. Frame it and keep it accessible. Those are your uncompromisable items. Everything else is negotiable. Amazon was never intended to just be an online bookstore or even just an online retailer. Books just happened to be the easiest entry into the marketplace at the time. And for Bezos, Amazon was just the beginning. In 2000, he secretly founded Blue Origin, a space exploration company, to fulfill his ultimate dreams of not only exploring deep space, but eventually colonizing other planets as a backup option for Earth. Think about your dreams versus the tools you’re using to get there. Don’t confuse the two, and don’t settle for the easier option. Hope this helps you further towards your goals and success!